Maple cake with candied bacon is eating breakfast for dessert adapted from cookbook by Lindsay Taylor, Breakfast for Dinner. Enough for 12 cupcakes or a tiny six inch cake. Cream together brown sugar and butter for two minutes at least. Add eggs one at a time. Mix on medium for 45 seconds. Add in dry mixture a little at a time. Mix on medium. Mix in buttermilk on low speed. Pour into two six inch buttered-floured cake pans or 12 cupcake tins, lined. Bake at 350 for 18-25 minutes, or until a toothpick comes out clean. Cool completely prior to frosting. For the tiny cake, you can do two or four layers. This will serve up to 8 people, small pieces or 6 large pieces. Mix together butter and cream cheese on medium high speed until incorporated. Turn to low-medium speed and add in confectioner's sugar ½ cup at a time. Once sugar is added, add in maple syrup and incorporate. I didn't have maple extract and added in another teaspoon of maple syrup. Add in heavy cream as needed and beat for a few minutes until fluffy. Frosting can be refrigerated up to three days before use or frozen. 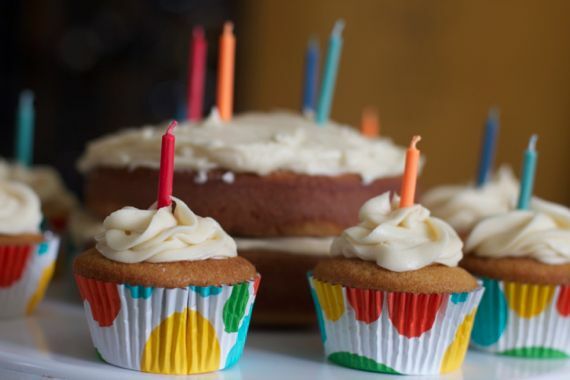 This recipe makes a tiny cake (six inch cake pans) or 12 cupcakes. Double the recipe for a whole cake, using 9 inch cake pans.